They're all gorgeous, but Donna Ellis's purple set just stands out as it's different than the same old same old. Those are really tough choices this time, but I love the three similar cards done by #5 and the flower embellishments. Gorgeous! I clicked vote but just in case my pick is number 5 Donna. They are all gorgeous but my favorite this time is Chris because she used one of my favorite new images. They are all gorgeous but I particularly like the one by Donna Ellis. 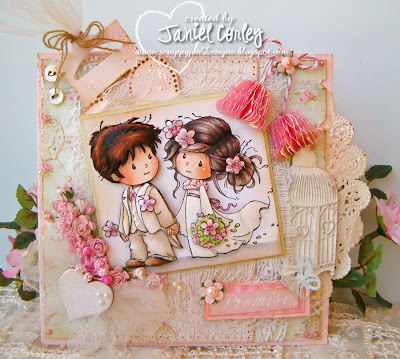 It is fantastic with all of the embellishments and the paper is lovely. Wow, they are all fabulous. The color and various textures of #5 are divine. Look how that bling circles the bird. Wonderful. They are all fabulous, very hard to pick a favorite, but I did. I loved all of them but I was especially attracted to the wonderful work of art by Donna Ellis. I hope my vote went through as it seemed there was a connectivity problem for some reason. And, I have no way to check it out if it did go to Donna. I have voted they are all gorgeous, but I have voted on number one love those Besties images. I have also voted No1, it is gorgeous. Fantastic cards, they are all so beautiful. Hi, I've voted for No2 but don't know if my vote went through - nothing seemed to happen. Well done to all the Top 5 ladies, they are all so beautiful and whoever wins they will have deserved it . . . stunning creations. While all the top 5 creations are winners I think Donna Ellis has the most creative and elegant project of all the contenders. These are all so lovely, and you can see all the love that was put into making them. My two favs are the last two. The little bride and groom are so adorable, and those little wedding bells! But I think I have to vote for the last one by Donna. Purple is a favorite color, the paper is scrumptous, there are 3 different yet similar designs and so much eye candy to delight us. Thanks for a wonderful challenge. They are all beautiful but my favorite is Donna's cards. This is the first time for me, helping to pick out the winner in a challenge. What a lovely way to choose a winner! All of the creations are realy beautyful but the card from Becky is the winner for me. I love Donna Ellis's cards. They are just beautiful. All 5 cards were worthy of a vote. I have voted on number one love those Besties images. All of the creations are beautiful. So many wonderful creations, but the first one is definitely my favorit, to be honest. It´s absolutely gorgeous work and colors. So beautiful. Amazing and gorgeous creations!! Definitely hard to pick just one!! Beautiful designs, so many details on all of them, but I vote for NO 5 as Donna has created a beautiful & elegant set of three. Congratulations to all ! I vote for chris its FAB!!! They are all wonderful but I voted for Donna E.
Beautiful card, but I love the first one, great image, coloured beautifully and gorgeous embellies. Gorgeous Cards ladies, very hard to vote, but my favorite one is #1. I've voted for #1 Chris. Good luck girl..
All of these are great! It's hard to pick just one. Stunning creations ladies and good luck to you all. I have voted for Becky. 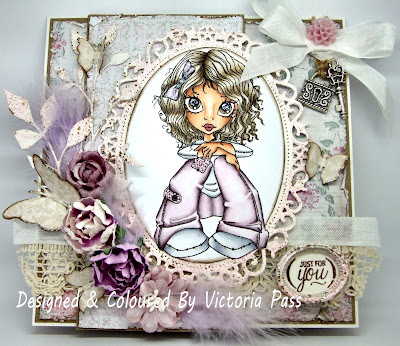 She inspires me with her gorgeous creations and I just love how she arranges those pretty flowers onto her cards. All are absolutely fabulous but #5 took my breath away. It is so very elegant. Such elaborate and gorgeous cards, but my favorite is Donna Ellis's - hers is elegance extraordinaire! Such beautiful cards chosen for the top 5. Have made my choice which was very difficult. Love #5, Donna Ellis. Much different than the others and so pretty with the birds. Gorgeous. So hard to choose, but it's done. Godd luck to you all!! Have voted. Was hard to choose, they are all beautiful. Such beautiful cards!! Was hard to vote for a favorite!! My favorite- hands down- is Donna Ellis. Everything seems to flow beautifully. I love the choice of colors and the elegance of the whole artwork. Beautifully done and well thought out. Love her work! I finally made my vote - but it was hard. All 5 creations are gorgeous. All are fantastic; so difficult to choice only one, but I finaly done. Elena F.
have voted but numbers 1 and 3 are my favourites. All five are the perfect picks for the top five place! They all are just fabulous! My favorite though is number 1, Chris. Good luck to all. Wow, these are all fantastic! Tough choice, but I voted for #1. All 5 are absolutely gorgeous, LOVE the sweet image and wonderful colours on Chris's one. It was so hard to vote for just one, i wanted to vote for them all. beautiful job ladies! All are gorgeous and so beautifully designed with outstanding embellishments. I voted! Fantastic top 5. I have voted. So hard to choose, they are all so gorgeous....but I think Becky's card is my favourite. Congratulations to the Top 5!!! You all deserve to be there. As difficult as it was, I was able to cast my vote! All lovely but Chris's is just stunning ! Everyone's work is fabulous, but I had to vote for Chris as my fav! I have cast my vote! Well done all 5 of you! Beautiful creations every one! Wow what a great bunch of creations. I voted for Donna as i love her journal. Great job to everyone tho. Love them all. Difficult decision I love them all. All very pretty but #1 gets my vote. Or at least I think it did. Not sure whether the voting thing actually did anything.